Speaking of boring films, Amour is one helluva piece of work. While films about death can be engaging and even eye opening, Michael Haneke’s film is arduously true to life. The film follows an octogenarian couple facing the end of their lives in their French flat. After Anne (Emmanuelle Riva) suffers a stroke, her husband Georges (Jean-Louis Trintignant) must care for her as she slowly dies. This tests his intense love for her, causing him to lose his mind as hers deteriorates. Both Riva and Trintignant deliver powerful performances that make the film feel even more painstakingly real. Haneke’s writing and direction are also vividly realistic. But this film feels more like a horror film for audiences over the age of 60. Perfectly capturing this couple dying of old age, it serves almost as a warning of what’s to come in most of our lives (and most likely hitting too close to home for the aforementioned demographic). It’s enough to make you want to kill yourself at age 50. Because this is a foreign-langue film, shots dwell languorously on the minutiae of their lives. Do we need a 5-minute shot of Georges clipping flowers to know what he is doing? Most of this film is comprised of this painful realism, increasing the inevitable horror of old age. As strokes continue to ravage Anne’s mind, can you really blame her for begging Georges to end her life? This year’s batch of Best Pictures is bloated with excessively long films (like Lincoln, Django Unchained, Les Miserables, Zero Dark Thirty); and Amour fits right in with them. Its extensive length causes you to almost forget Riva’s compelling performance or Haneke’s brilliance in telling such a “normal” story. 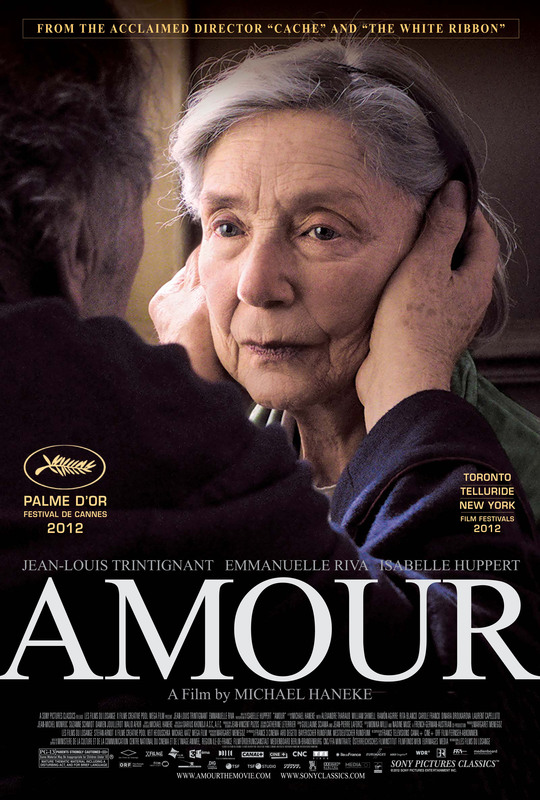 However, Amour is a horrific film to sit through and a horrific glimpse into old age. Referring to Steven Spielberg’s film Lincoln as a biopic is a bit of a misnomer. The film’s action is centered around the final months of President Abraham Lincoln’s life as he fights to get the anti-slavery amendment passed. Following the political machinations involved with the amendment, Lincoln feels more like an extended episode of The West Wing than a biopic of Lincoln’s life. Because it’s a Spielberg film, he’s managed to accrue an all-star cast. Daniel Day-Lewis astutely plays Lincoln, vanishing into the character and easily managing the monologues screenwriter Tony Kushner wrote. Sally Field earnestly plays his wife Mary Todd, and Joseph Gordon-Levitt brings a little depth to his rebellious son Robert. Among the Washington politicos are a variety of names you will most likely recognize: David Strathairn, Hal Holbrook, John Hawkes, Lee Pace, and Tommy Lee Jones (and keep your eyes peeled for a special appearance by Girls’ Adam Driver). Even if you can manage to get engaged in the struggle for amendment votes, the big vote occurs around the 2-hour mark of this 150-minute film. That leaves a full 30 minutes to show a ponderous Lincoln, slowly moving to his inevitable assassination (which is as equally anticlimactic as the amendment vote). 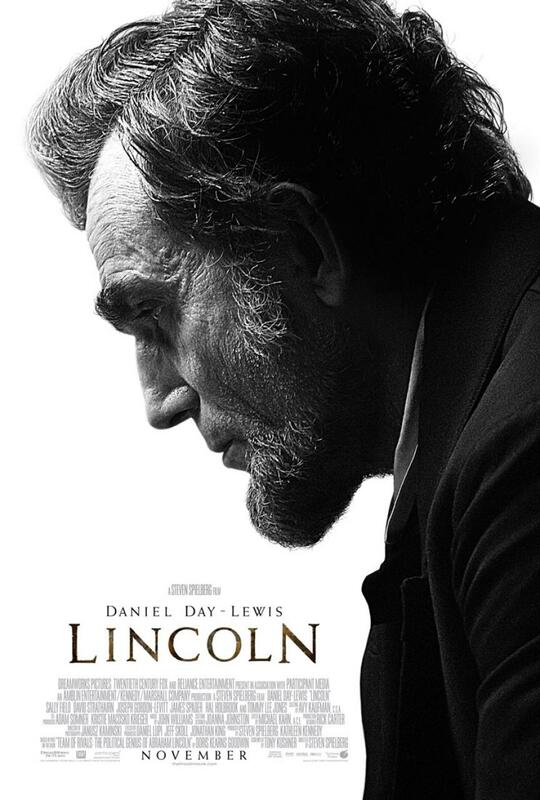 Lincoln is one of the most over-hyped films of this Awards season, and the one you’re least likely to see. And you might as well keep it that way, unless you’d like to pay $14 for a nap. Just like Inglorious Basterds, Django Unchained is a revenge period drama replete with Quentin Tarantino’s quintessential gore, violence, and foul language. 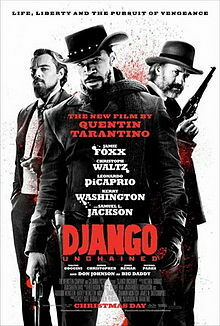 Jamie Foxx plays the eponymous hero who is freed from slavery by Dr. King Schultz (Christoph Waltz), a bounty hunter who needs Django to identify some vicious slave owners. From there, Schultz trains Django to be a ruthless bounty hunter so they can track down and free Django’s wife Broomhilda (Kerry Washington). Although it takes place in the Deep South, Django’s style and tone resemble Western films. Schultz and Django are a team of cowboys who have excellent shooting skills with a pistol. They’re a capable duo that must infiltrate Calvin Candie’s (Leonardo DiCaprio) plantation and slyly wrangle for Broomhilda’s freedom. Tarantino’s Oscar nomination for the screenplay (and Golden Globe win) is mostly deserved. He’s crafted a well-told story that combines exposition with action and never leaves you feeling bored. But fatigue sets into the viewer and the story in the final, indulgent thirty minutes when the story strays into a long sequence of gratuitous violence that does nothing to sustain or expand upon the story. While Basterds is similarly long in length, it doesn’t feel as long because the story feels incomplete until the end. However, Django could have easily been tweaked to have a satisfactory end in the first Candieland shootout. Length problems aside, Django is another great Tarantino film that will please his fans while also providing amusement for those who find him to be a bit much. There’s surprisingly little gore in the first two hours of the film, making it an easier entry in his oeuvre to stomach. And his controversial use of the n-word in the film feels more apt than scandalous, adding believability to the characters. This film is definitely one of the more entertaining films in the Best Picture category this year.